Let us help make your wedding the most memorable day of your life. Our staff is here to assist you every step of the way. Our elegant ballroom will wow your guests, with its high ceilings and grand entrance. 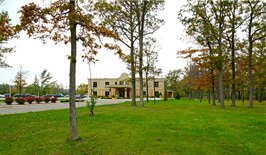 With an 18,000 square foot facility, we can comfortably host up to 550 guests. Our 14-acre natural haven is the perfect setting for an outdoor wedding service. We encourage you and your guests to take the time to explore and enjoy the grounds. 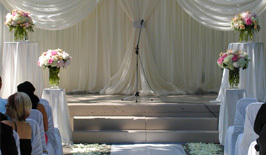 All wedding packages include the services of our professional decorator. A range of elegant decorative options are available, including your choice of white or ivory table cloths and a variety of chair covers. 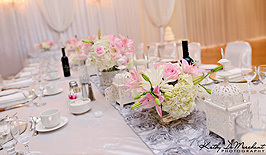 We will dress the head table and backdrop to your taste, and offer additional design consultation upon request. Our skilled culinary team will change the way you think about wedding food forever! 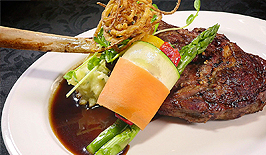 Allow our executive chef to create the perfect menu for your special occasion. Bring your storybook wedding to life at our scenic estate. Beauty, elegance, and attention to detail are our hallmarks, enabling your romantic dream to become reality. Our unique venue has it all, allowing you to create an intimate experience with your loved ones. On our private estate we can provide an indoor or outdoor ceremony, along with opportunities to enjoy nature, to best suit the vision of your perfect wedding. Revel in nature’s beauty on our majestic grounds… an unmatched setting for your fairy-tale outdoor wedding. We are a full-service facility for weddings, receptions, corporate events, and other special occasions. Let us take care of everything while you enjoy the moment. ©2011 Winona Vine Estates. All Rights Reserved.